Yeah. This is stunning news. 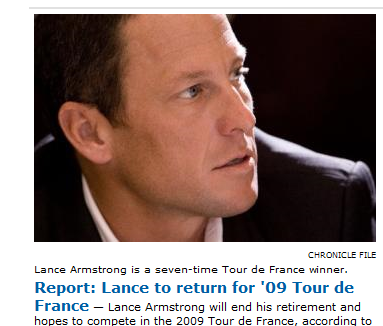 Maybe he feels he “still has it,” maybe he feels that the international cycling bodies will keep the cheaters/dopers out of the mix. I haven’t even read the article yet – I am just soaking in the possibilities. I wonder if he would ride with Team Columbia to reunite with George Hincapie? That would be too cool. More likely though, the businessman in Armstrong would create a new team that creates a HUGE windfall of income for this “last hurrah.” You can bet I will be watching this story.